What is the Washington Island Ferry schedule? You can find the Washington Island Ferry schedule here Go to the washington island page and view the washington island schedule, and in our annual brochure offered at most Door County establishments. How much does the Washington Island Ferry cost? $13.50 per adult, $7.00 per child ages 6 through 11 and children ages 5 and under are free. You can find more pricing here View pricing for the washington Island Ferry. Transportation is recommended on Washington Island. You can bring your vehicle, motorcycle or bicycle on the Washington Island Ferry. Once you arrive, bicycle, UTV and moped rentals are available adjacent to the Washington Island Ferry dock. You can find more information here View all FAQs. Leashed pets are allowed on the main decks of the Washington Island Ferry and the Rock Island Ferry. How many cars can you carry per boat? Each Washington Island Ferry can carry 149 passengers and 18-22 standard-sized vehicles. Where is Northport Pier located? Northport Pier is located at 215 WI-42 Ellison Bay, WI 54210 Opens Google Maps in a new tab i.e. at the end of Hwy 42. This is where visitors board the Washington Island Ferry to travel to Washington Island. Where can I park on the mainland? 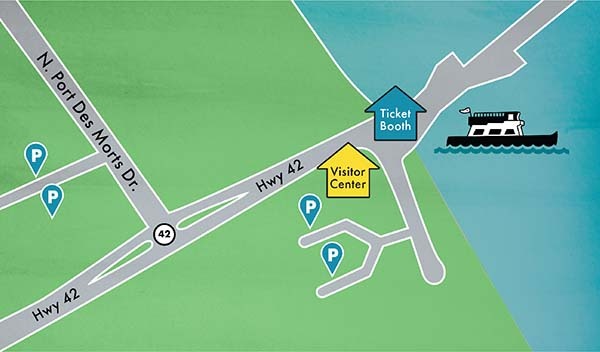 If you plan to visit Washington Island without your vehicle, parking is available in our lots near N. Port Des Morts Dr. and behind the Visitor Center. You can find a list of Washington Island activities and attractions here Visit the plan a trip page to learn more. What is the Rock Island Ferry schedule? You can find the Rock Island Ferry schedule here Go to the rock island ferry page, and in our annual brochure offered at most Door County establishments. How do I get from Door County to Rock Island? Take the Washington Island Ferry Go to the washington island ferry page (30 min. trip) from Northport Pier—end of State Hwy. 42—to Washington Island. Then, it’s approximately 8 miles (20 min.) across Washington Island, from the Washington Island Ferry dock to Jackson Harbor, where the Rock Island Ferry is located. Allow time for parking your car (free!) and unloading your gear before boarding the Rock Island Ferry. Make sure to observe scheduled leaving times for the Rock Island Ferry. How do I get Rock Island State Park information? Find more information hereOpens the DNR website in a new tab. Where can I park? Do I need a Wisconsin State Park sticker? Park in the State Park lot, adjacent to the State dock in Jackson Harbor. No stickers are required, and there is no entry fee to visit Rock Island. But, you’ll need your ticket for the Rock Island Ferry. You may purchase combination tickets for the Washington Island Ferry and the Rock Island Ferry at the Northport Pier Ticket Booth. If you intend to camp on Rock Island, reserve your campsite Opens link to the DNR website in a new tab through the state’s website. On busy summer weekends, that is the only way you can be assured of a campsite on Rock Island. For day visits, you may park and cross on the Rock Island Ferry. Are bicycles allowed on Rock Island? No, Rock Island does not permit bicycling. Can I use a cart or wagon for hauling my camping gear? Yes, wagons and carts may be used to transport gear from the Rock Island Ferry dock to your campsite. There is an additional $3.00 fee per cart or wagon to transport camping gear. What sort of camping experience will I find on Rock Island? Rock Island has rustic sites for tent camping. Campsites have fire rings and grills. Pit toilets are near the camping area and there is an indoor toilet (water flush) but not public showers. There is a beach nearby for swimming. No supplies are sold on Rock Island so bring your necessary food and supplies. The Rock Island ranger advises packing only what is necessary for your stay. Be prudent in your packing. Packaging and garbage must then be carried out from Rock Island by park staff. Leashed pets are allowed on the main decks of the Washington Island Ferry and the Rock Island Ferry. Be responsible for your pet and respect other campers. Please clean up after your pet, even in the State Park woods. What sort of activities will I find in Jackson Harbor? How good is cell phone coverage from Rock Island? Fair to good on the west side of Rock Island. New cell towers were installed on Washington Island and coverage greatly improved for Verizon, Cellcom and U.S. Cellular customers. There are “shadow” areas behind bluffs. Your phone’s digital clock may adjust to nearby Upper Michigan (EDST) time from cell towers located there. Call 911! First aid can be administered with help of Rock Island State Park staff, or at the Washington Island Clinic. Serious medical emergencies will require the aid of the Washington Island Rescue Squad, Clinic Staff (and sometimes the U.S. Coast Guard). Patients may be transported to the mainland from Detroit Harbor by special ferry to Northport. Rock Island’s State Park ranger, when notified, will help emergency services by alerting the necessary emergency care providers. Can I take a canoe, kayak or boat to Rock Island? Yes, you may beach paddleboats near your campsite. Larger craft may moor near the boathouse, depending upon available dock space. Jackson Harbor has a free boat launch ramp at the Rock Island State Park dock on Washington Island. Safety Warning! For your safety, please be aware of impending weather, wind and wave conditions. Currents, and even submerged rocks, may also present a hazard. Always wear your personal flotation device when boating and let others know where you’re headed and what your objectives are. What sort of entertainment activities are on Rock Island? You will find Rock Island to be rugged and scenic, yet very friendly for hiking. There are well-marked nature trails, and a park naturalist offers his knowledge of plants, geology and the history of Rock Island’s early inhabitants. Two unique structures on Rock Island provide a wonderful historical perspective—the Pottawatomie Lighthouse and the C. H. Thordarson Boathouse. The boathouse immediately adjacent to the boat landing on Rock Island and is open daily for self-guided visits. In season, docents who live in the lighthouse will educate visitors about Rock Island’s light keeping history. Excellent books have been published that describe Rock Island’s history. These books describe the periods of early native inhabitants, French voyageurs (including LaSalle), the fishing village pioneers, and the Rock Island estate of C. H. Thordarson—all of which predated the Rock Island State Park. Are there Rock Island Ferry group rates for large numbers of campers, church groups or scouting groups? Yes, group rates are for organized groups of 15 or more. Groups must board together and one person must pay all fees. Contact us to make arrangements in advance. How can I learn more about Rock Island and its history? Besides local history books, a good way to learn and become involved with Rock Island is to join the Friends of Rock Island Opens friends of rock island website in a new tab (called FORI). FORI Members are from everywhere, not only Wisconsin. They have an abiding passion for nature, history and for the lighthouse on Rock Island. This is a volunteer organization, but even if you’re not able to volunteer, your financial support helps to keep many facets of Rock Island going, and in turn, FORI supports makes Rock Island’s camping and visitor experience that much richer for everyone. What is the Cherry Train tour length? Over 15 miles, up to 2 hours for each tour, with at least 3 stops at points of interest along the route. What sort of weather can we expect? How should we dress? Lake Michigan air can be cool, even on what may otherwise seem to be a warm day! Dress comfortably in casual wear, but consider bringing along a jacket or light sweater, even in summer. Trams are covered, but the ride is open air and exposed to weather elements. You may purchase your combination + cherry train ticket at the Northport Ticket Booth - the best way to reserve a seat on board the train. You may also purchase Tour Only tickets at Northport Ticket Booth and on a space-available basis at the Island Ticket Booth. What about parking for our car? Restrooms? Tickets? Signage directs you to free parking on either side of the highway at Northport Pier. Restrooms, information and tickets are available at the pier. What if we want to take the Tour, but also bring our car? No problem. Approach the ferry ticket booth in your car, and ask for a round-trip vehicle ticket in addition to the Combination Ferry + Cherry Train Tour ticket. Many people bring their car to Washington Island to spend time exploring on their own after the narrated tour. Cherry Train Tours do not cover the entire island or stop at all points of interest. You will have an opportunity to do so with your own transportation on your own schedule, after the introductory tour of Washington Island by Cherry Train. What about shops, restaurants, places to stay? Washington Island is a complete vacation community, a year-round community in fact, with a variety of businesses to meet your needs and desires. This is one reason to have your own transportation should you wish to shop, dine or visit places off the typical Cherry Train Tour route. If you stay for the night, you will most certainly want to bring your own vehicle. What about pets on the Cherry Train? What ferry departure time should I use to meet the Cherry Train on the Island? Since the ferry crossing takes approximately 30 minutes, board a ferry that leaves at least 45 minutes prior to the Cherry Train Tour start. If you look on our Cherry Train Tour Schedule, you will see ferry times suggested in order to make a particular tour time. Will the Cherry Train bring me back to the dock in time to catch the ferry back to the mainland? Our drivers are skilled at making these connections, and receive a high level of satisfaction in meeting the return ferries each time! If concerned about a tight connection, please ask our driver prior to boarding to reinforce the importance of catching the ferry. From the other side of this question, we’d like for your tour to be leisurely, not hurried, and you may enjoy a bit of time to shop, buy a snack, or just enjoy the scenery and activity prior to boarding for your return trip. Your round trip ferry ticket is good for any return ferry, any time, any day. What is the best time of year for birding? Discover birds from South and Central America in the summer and birds from the Arctic and Canada in the winter. The month of May is an exceptional month for birding on Washington Island, but there are opportunities all year-round. Are there places for public shore access? Yes, where roads end at the shore and several island parks: Percy Johnson County Park, Jackson Harbor Ridges, Rock Island State Park, Schoolhouse Beach, Jacobsen’s Museum at Little Lake and Sand Dunes Beach.